“Tlön, Uqbar, Orbis Tertius” is a short story by the 20th-century Argentine writer Jorge Luis Borges. The story was first published in the Argentine journal Sur, May 1940. The “postscript” dated 1947 is intended to be anachronistic, set seven years in the future. The first English-languagetranslation of the story was published in 1961. For the Orbis Tertius installation I imagined Ritualistic items and dress, transgenic organs, as well as Flora and Fauna one might discover in Tlön. Displayed in custom, vacuum-formed domes to create a museum-like, or clinical environment. 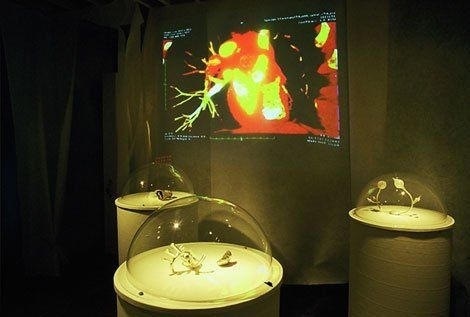 MRI heart scan, along with 3D humanoid representations added to the clinical feeling visitors had when entering the installation.